A year ago, you couldn’t find Johnny playing football with his friends. He used to work 6 days a week from morning till evening in a small launderette to be able to support himself, his ill mother and a younger brother. Thanks to the initiative of the band called Pio Squad and your gifts, everything has changed dramatically! When we visited the families of children of the education centre in Chalantika at the beginning of last year, we also met the Johnny’s and Ismail’s family. Their mother Nahar narrated to us about her uneasy situation: as her husband started to take drugs and left the family, she did not know at all what to do. Her oldest son Mo gave them a helping hand. He already had his own life and family, but with him, Nahar and the boys at least had a place to stay in. 6 of them have been sharing a shelter of 8 square meters made out of corrugated iron sheets in Chalantika, one of slums in Bangladeshi Dhaka. They lack decent living conditions, the corrugated iron sheets are constantly rattling, and bamboo poles on the floor are rumbling all the time, threatening to break apart. There is a stinking sewage pond underneath. However, the family is happy to have a place to stay in and to be together. They have no spare money. Mo uses most of his income, which he earns while working hard during night shifts in a textile factory, for food and rent of their primitive slum. Nahar cannot work long hours due to her illiteracy and complex health. There is no other remedy for the family than to involve also the eleven-year old Johnny in the financial support of the family. Neither Johnny nor his family knows how old he really is. Besides that, the age in Bangladesh is not an important figure as people have other worries than that. Similarly, so does the family with these two young boys. Johnny works in a small shop that washes clothes for customers. We visited him in the launderette where he spends 6 days of the week. He starts at 7 a.m. and works till 2:30 p.m., then he has a two-hour break and then he works again till 9 p.m. He receives clothes from customers, sprinkles, folds, irons, packs and gives back clothes to customers 6 days a week. He earns around the equivalent of 400 CZ in a month. His mother buys food with it – rice, oil, lentils, and vegetables. The family actually does not eat anything else, only occasionally they eat small fish. Ismail, the younger brother, is more lucky. 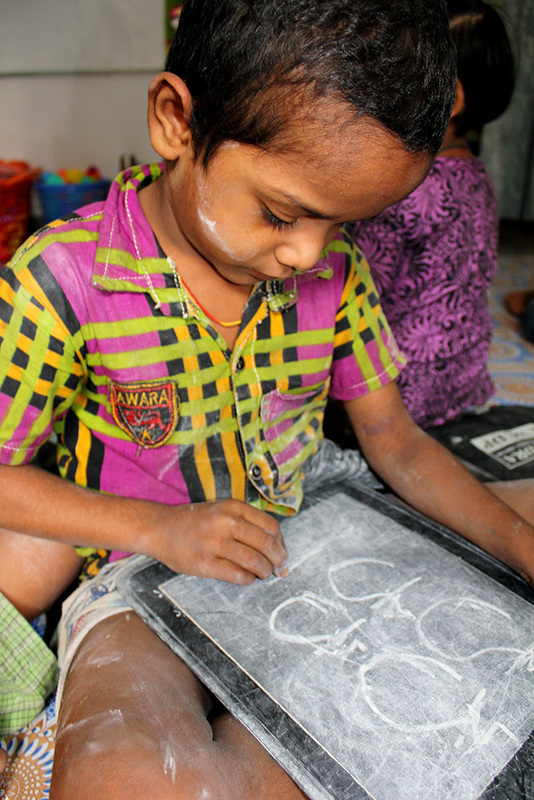 He got the chance to obtain education that can change his life – he has attended the Chalantika centre where local children learn to read, write, count and think independently. They also gain some basic social and hygienic habits. The aim is to prepare them in one year of centre attendance for a state primary school, in the hope that the children will be able to successfully complete the primary education. Ismail was also the first one who got the chance to get off the vicious circle of illiteracy. When parents are not educated, they can’t earn enough money and for this reason their children have to work as well. The children can’t go to school due to the work and so they do not receive any education,never receive a good job, don’t earn enough money, and their children will have to also work … and so on. Johnny also would love to attend a school, but he cannot. Bangladeshi custom dictates that the oldest son has a duty to help the family to survive. He has learned some letters from Ismail, but he would love to know more! He doesn’t know what he wants to do in the future. When asked, he just shrugged and said: “Kōna bhabiṣyata…” (no future). This is the perspective of a nice eleven-year old boy from a Bangladeshi slum – no future. We met up with Johnny once again. We worked together with the band Pio Squad to organize a one-day trip to a museum. Thanks to the generosity of Johnny’s employer, Johnny had a day off of work and accompanied Ismail this time. Johnny looked over-excited. He enjoyed the excursion very much. Surely he did – the children from slums can be only dream about trips by bus and picnics. It was emotional to leave Dhaka this time, with Johnny’s “no future” still ringing in our ears. We often remembered these words while we were back in the Czech Republic. There was a great surprise awaiting us in Chalantika centre in Dhaka this spring on our next visit. There was a laughing Johnny’s face shining like a lighthouse high above the other pupils in the back row of a newly opened Pio’s classroom. How was this possible? The explanation came quickly: The health conditions of Nahar have improved significantly thanks to the free medical care of a slum centre doctor, so that she is capable of working daily. 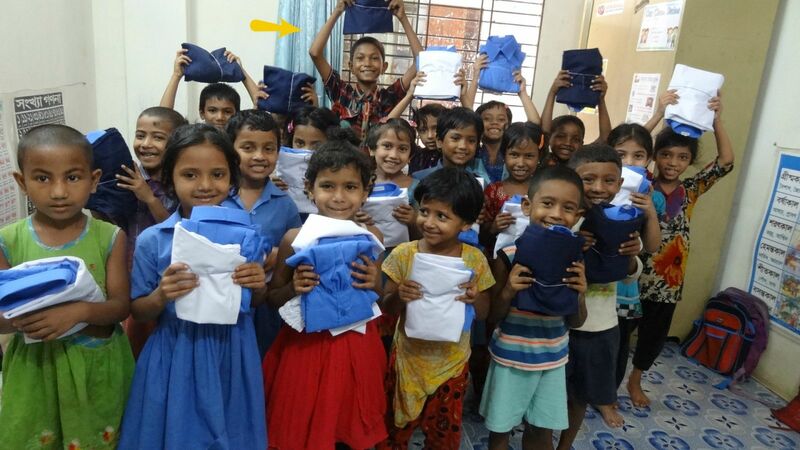 Even though Johnny is five years older than other preschoolers in Chalantika center, workers of the centre have happily accepted him into the preparatory grade. They gained a very diligent member of the class. Johnny does not want to miss out a single day, a single class. He attends a new Pio classroom. We believe that he will not miss this great opportunity which he was given - to get education, to have the childhood he deserves like all children all over the world. When we returned home we were smiling. We were delighted that Johnny’s ominous “No future” does not apply any more. We are glad that Johnny has joined a number of particular children who were helped by our Chalantika centre, and their lives were changed thanks to your gifts!